Has the craft beer machine reached saturation point? "I'm done with craft beer," said a mate at the pub last week. "I've given it a shot for a few years but at the end of the day I want a beer I don't have to think about." "I'm over it too," said another mate. "I'm sick of seeing the words 'craft beer' plastered everywhere like it's some kind of holy water. I wouldn't care if it was halfway drinkable. Or half the price..."
I half-nodded in agreement. I love craft beer. Really, I do. I'll happily drive three suburbs if a bottle shop has so much as even a sniff of Yeastie Boys. However, in the last six months I've also become less fond of what Dad refers to as "funny beers". I could spend $15 on a pint of the Brew Pig Hopinator T-1000 Prickly Peach Extra IPA. Or I could buy a jug of Reschs and play some pool. While there are people willing to pay $10.50 for a schooner of La Sirene at the Keg & Brew in Surry Hills, or $13.50 for a pot of Doctor's Order's "Operation Paralysis" (10 per cent alcohol) at St Kilda's The Local Taphouse, there's a craft beer backlash brewing and it's global. Budweiser knows it. Did you see the brewing giant's recent Super Bowl commercial? It's really quite a great piece of marketing. "Bud" proudly asserts itself as a macro brewery while taking the mickey out of stout-sniffing, moustache-fiddling, chambray-wearing beer boffins. "Budweiser is brewed for drinking not dissecting," we're told. What is causing this shift (and I am loath to use the following term) in "craft beer appreciation"? More importantly, what needs to happen for the shift to be reversed? And what the hell is craft beer anyway? What makes a "craft beer" craft? "There's not even a consensus in the industry," says Sydney Craft Beer Week Festival Director Joel Connolly. "For me, craft is anything that's made with a little bit of honesty, more integrity, and built in more of a traditional way." Can global brewing company's "boutique" beers like James Squire, Little Creatures, and Matilda Bay be classified as craft? "Most definitely," says Connolly. "Ignoring who owns it, although that's a difficult and controversial thing to say, the actual beers themselves are made with care, made for flavour and use more traditional methods. The guys that own those businesses, maybe their philosophy isn't in line with the craft beer movement, but it's still craft beer as far as I'm concerned." Wine writer Mike Bennie believes differently. "For me craft beer means small-batch brewing plus styles [of beer] different to the mainstream lagers or ales from the country they're being brewed in," he says. Bennie believes the lack of craft beer definition is going to lead to consumer disappointment with the "big companies pretending they're craft breweries when they're actually not." The question with a thousand answers. Perhaps craft beer is better defined by what it's not, then. It's not VB, it's not Carlton Draught, and it most definitely isn't Toohey's Red. Is the word "craft" half the problem here? Bennie remembers recoiling and laughing the first time he heard someone use the term "craft beer ". "I said 'What, did you make it of macaroni? Did you do some decoupage? Throw some glitter over it with a glue stick?'." Connolly says it's a useful word for people to be able to recognise a brew as different to a regular beer. "However, I do think the term craft has taken on a bit of stigma," he says. "People imagine that a guy drinking craft beer has to have a long beard and heaps of tattoos. That turns people off it." Oscar McMahon is one of the co-founders of Young Henrys. Young Henrys opened its first brewery in Newtown, Sydney, in 2012 and has since started a second brewery in Margaret River with a third to open in Adelaide this year. "Think about wine," says McMahon. "Australian wine had to come a long way before we started to become respected as a winemaking country. Beer is kind of the same. It's had to come a long way and the word 'craft' was used to say, 'Hey - not all of our beer is rubbish'." Is craft beer just another fast-rising fad? Connolly suggests the rise in craft beer's popularity is parallel to the growth in popularity of small farm, locally grown food. "People in Australia eat a lot better than they did 10 years ago," he says. "They care a lot more about where their food comes from. People are more interested in not just beer but wine and other kinds of alcohol as well." Connolly says craft is still only three per cent of the overall beer market in Australia. "More and more pubs are realising that they need to have a craft option and they're marketing to that," he says. "That might lead to the perception that it's just too much and perhaps this is an indication that craft beer has come on too fast." "Every single month there's a new craft brewer popping up and with that comes a whole batch of new styles of beer," he says. "Maybe it is overwhelming. Maybe the punter hasn't totally caught up with that. But, I certainly think there's still a stack of room to grow. Not just growth in terms of the amount of beer produced and sold, but in terms of the development of the industry and the way brewers operate. I think we're just at the very beginning of it." Bennie believes there is a problem with the lack of definition in the craft beer category plus over-enthusiasm for a category without really understanding it. "It has led to just about any venue, anywhere in Australia, thinking that a craft beer list is compulsory and often misunderstanding what the category is and presenting a range of beers that don't represent what craft beer really should be." "Uni [sea urchin] is not the sort of thing you want to eat all the time," says Bennie. "But when you do eat it, and it's awesome, and it comes from somewhere really good, it's brilliant. However as soon as you start putting uni on the menu every day, it's not that great. In some respects that's how I feel about a lot of craft beer. It's something you just want every now and again to give yourself a more complex, complete experience with beer." Why are there very few "slammable" craft beers? I've found I can't have more than one or two craft brews without needing to move to something more standard. There are exceptions to this. Breweries like Mountain Goat, Stone & Wood, and Young Henrys make fantastically smashable craft beers. But why aren't there more easy-drinking craft lagers instead of hoppy ales? Surely drinkability should be the primary focus of beer? "The biggest challenge with lagers is they take a lot longer to brew," says Connolly. "Craft brewing is expanding at such a rate that brewers don't have the space or time to hold beer for that long in their breweries. But I see your point. Sometimes you don't want a flavoursome beer and I see people returning to those more smashable lagers as well. Maybe brewers in Australia need to be paying more attention to the climate and temperature that we have and brewing a little bit closer to that." "I think it's harder to make something with subtlety and balance than what it is to just empty the hop cupboard," says McMahon. 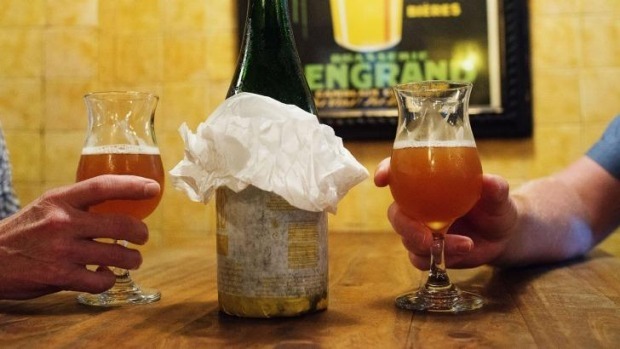 Why are craft beers more expensive? It varies from pub to pub and beer to beer, but a craft beer is often 30-50 per cent pricier than a house standard. A big reason for this is harsh tax excises on small breweries and industry groups are lobbying the government to have things changed. Connolly also points to the age-old issue of supply and demand. "The ingredients that craft brewers are using in Australia have never been asked for before," he says. "The big breweries have always wanted the very same things from their hops and malt. But now you've got craft brewers coming in and demanding all these weird varieties of hops, specialty malts, and weird yeast strains. While the production of that stuff is still catching up to demand, and while hops are fiercely competed for, craft beer prices will be up a bit." So, give it time, people, and we should start to see craft beer drop in price. "It's a funny thing," says Bennie. "On one hand I'd like to say I don't really concern myself where craft brewing is going to end up. I'm concerned where great beer is going to end up. "The overt hop-driven styles, the ones that are almost to a point faulty in their excess of one ingredient, they have to have a shelf-life," he says. "People will start realising those beers aren't as good as they think they are or as sessionable as they think they are. People will come back to beers that have a deft touch but also great personality." Connolly hopes that craft beer shrugs off the "inner-city hipster image" and returns to its basic ideals. "First and foremost, it's meant to be a local thing," he says. "Every town should have its own brewery. It's not like wine where you need a vineyard and the right growing conditions. You can put a brewery just about anywhere. I think neighbourhoods and communities will start to have their own local breweries." "A lot of craft breweries need to learn about brewing better beer," he adds. "They also need to learn a little bit about market and business development. Some of these businesses are so young they're kind of flying by the seat of their pants. A little bit further down the line they'll get to know a little bit more about brewing for the market and climate." "I'd like it to be just 'beer' instead of craft beer," says McMahon. "I'd like for the people who drink junk beer to think more and I think I'd like a lot of people who drink craft beer to maybe think a little bit less. "Not everything has to be overly thought out," he says. "Sometimes beer is just there for when you knock off. As long as it's well made, balanced and enjoyable, and made with love, that's a beautiful beer."